Nos. 8-13 Bedford Row were built between 1717-18 by Robert Burford, carpenter, on land leased to him and George Devall2, plumber, by Margaret Skipwith in 1716. Most of the houses were altered in the 1820s. They are of brown or yellow stock brick with some refacing of upper storeys and parapets. The tiled mansard roofs are at right-angles to the street front, those to Nos 10 and 11 are slated. The houses are Grade II listed. Each house is two rooms deep, originally with a cross passage between them but in the early nineteenth century this was incorporated into the front rooms as a buffet alcove. All have closet wings. The principal stair, which is towards the rear of the wide stair hall extends to the first floor only, with rooms over this space at upper levels. The houses are of four storeys with basements. They are each three windows wide except for No.11 which has four windows. The windows have gauged red brick arches and dressings to flush frame sashes. Brick bands at first floor level. No. 13 has a wooden architraved doorcase with good carved brackets, panelled soffit to flat hood, with patterned fanlight and panelled door complete with original hinges and bars. The interior of No.13 has a fully panelled entrance hall, and staircase of identical pattern to those in Nos 8, 9 and 12. However, the staircase hall has plaster moulded swags and drops between panels, with richly moulded fruit and leaves – rare in a London townhouse of this date. The ground-floor front room is divided by timber columns supporting an arch to the rear buffet. It also has box cornices and full panelling with a nineteenth century fireplace. The rear room is also fully panelled with closet, the latter was carefully restored on all floors in 1992. The first floor front room has a handsome early nineteenth century marble fireplace and cornice. The rear room has eighteenth century panelling and a marble fireplace in a later Victorian surround. The door to the closet is treated as a continuation of the panelling to dado height with the upper section treated as a window with early nineteenth century glazing bars. The closet is panelled with an 1820s grate. A closed string staircase rises from the first to the third floors through the centre of the house at right-angles to the street. The second-floor rooms have ovolo panelling, box cornices and a cupboard with H-hinges. There is a nineteenth century fireplace in the front and an eighteenth century one in the closet. The third floor retains some simple panelling and matchboarding, with an eighteenth century corner fireplace at the rear. 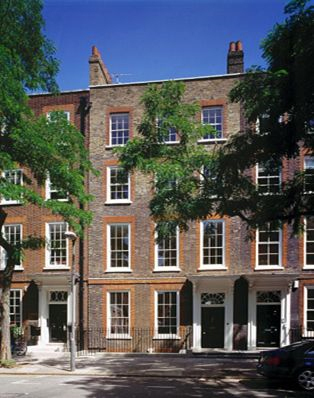 Over the years I have worked in many such houses and the experience gained of carrying out the analysis of the Handel House; the Benjamin Franklin House and Artillery Lane (for example) has helped give him a clear idea of how such interiors were treated. I am frequently asked by developers to devise colour schemes appropriate to the age and style of the building that is being refurbished. On this project they selected colours from the paint ranges produced by Papers and Paints. More recently I have carried out a similar exercise on No.8 Bedford Row. Much of this has been taken from the List description. 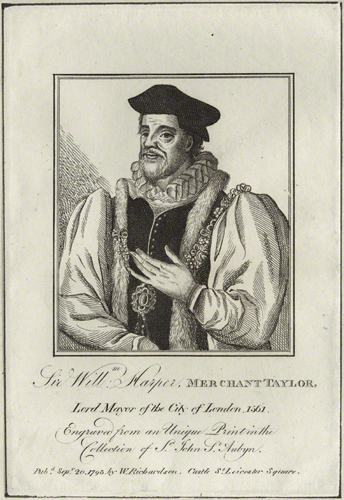 1Harpur also bequeathed the land on which Lamb’s Conduit Street was built. 2George Devall had also been employed on the Radcliffe Camera, in Oxford.